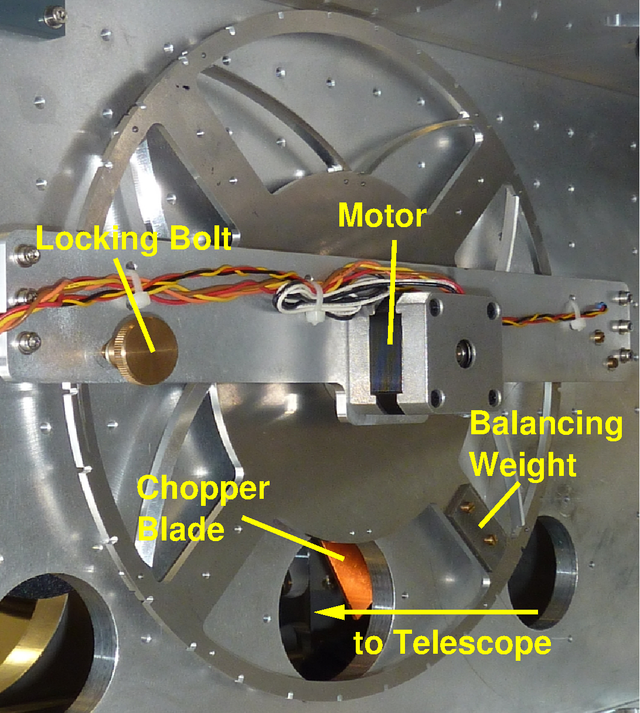 We developed a compact measurement device to determine the position of a beam in a radio optical setup. The unit is used to align the Terahertz optics of the GREAT instrument on the airborne astronomical observatory SOFIA. With the receiver looking at its internal calibration cold load, the scanner moves a series of warm opaque bars through the beam (Fig. 1). To obtain 2D position information from this 1D measurement, these shadow bars are tilted by ±45 ◦ with respect to the direction of motion. A beam displaced by Δh and Δv with respect to the optical axis causes an offset of Δx1 = Δh + Δv in the measurement for the first shadow bar and of Δx2 = Δh − Δv for the second shadow bar. Thus, the beam offsets can be calculated as Δh = ( Δx1 + Δx2 )/2 and Δv = ( Δx1 − Δx2 )/2. The shadow bars are mounted to a large measurement wheel that can rotate between the receiver cryostat and the instrument’s calibration cold load. The wheel carries three sets of shadow bars of different widths (1, 2, and 4 mm), to approximately match the beam sizes of GREAT’s different frequency channels. To maintain the 45◦ tilt of the shadow bars with respect to the direction of motion at all radii, the bars take the shape of logarithmic spirals. The measurement wheel is mounted to the shaft of a stepper motor with 400 steps per turn, driven by a controller capable of operating in microstepping mode with up to 128 microsteps per step, allowing a minimum nominal step size of 0.007◦, which corresponds to 10 μm at the radius of GREAT’s optical axis. We show an example of a beam measurement of GREAT in its 1400/1900 GHz configuration. 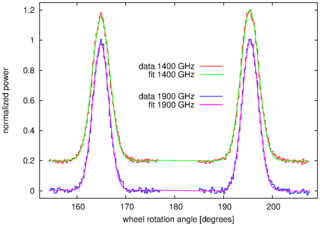 Gaussian fits to the high-quality data yield a very accurate measurement of the beam position. 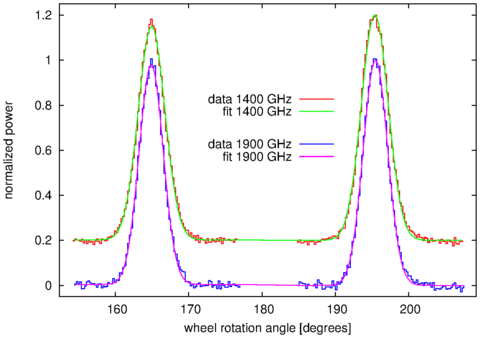 Typically, beam measurements are repeatable within a few tens of microns.